MK Haim Yellin submits request for emergency meeting to discuss protection, deterrence after Hamas rockets intensify. MK Haim Yellin (Yesh Atid) submitted a formal request for an emergency Knesset session Saturday night, following rocket fire from Gaza which struck a field outside Ashkelon. "Residents of the south stand firm against the barrage of rocket fire, while the Israeli government does not stand firm against Hamas," the explanatory note for the request states. "In the absence of a formal policy, is no wonder that we can not reach a long-term agreement, and military ping-pong continues - no military victory will not help without a political decision." "Operation Protective Edge never finished - a war is finished when there is an arrangement that leads to quiet," it continues. "It cannot be that Israel will rehabilitate Gaza without demilitarization; this is a blatant violation of the promise of the Prime Minister and Minister of Defense." "When leaders need to attack and defend their citizens, they choose to bury their heads in the sand," it adds. "Israeli citizens are entitled to the quiet! In view of the continued rocket fire at Israel, I will raise this issue on the Knesset's agenda." Yellin is not the first MK to call for deterrence Saturday night, after the latest round of rocket fire marks three incidents in two weeks. "We must not acclimate," Yisrael Beytenu chairman and former Foreign Minister Avigdor Liberman stated Saturday night. "There is no such thing as a trickle [of rocket fire - ed.] and there are no 'rogue organizations' - there is only one meaning for shooting of each rocket: civilians, children, women and men who can not maintain a normal life." "We must not get used to it again because getting used to it is tantamount to agreeing to it, and the country whose citizens are important to it cannot agree to that." 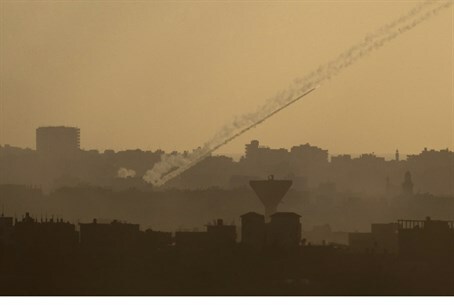 "We can not accept the situation in recent weeks, in which rocket fire - no matter from whom - from the Gaza Strip into our territory," MK Ofer Shelah (Yesh Atid) declared. "Israel should establish a clear policy, declare consistent punishment for rocket fire, and exact a price from Hamas, which is responsible for the area." "At the same time [Israel should] move the process to mitigate Gaza's recovery and disarmament and the prevention of all fire from Gaza," he added. 'The lack of political and military action ensures that the next round is waiting." Others took a more liberal approach. "The situation in the Gaza Belt is not good," MK Maj. Gen. Eyal Ben Reuven (Zionist Union) stated Saturday night. "We are witnessing the shooting weekly from the Gaza Strip when Hamas, apparently, is not able to exert control over jihadist terrorist organizations operating in its territory." "The State of Israel cannot accept this and must give protection to residents of the south." "The response should be in the face of responsible - Hamas," he continued. "Yet while we should launch a severe reaction, such a reaction should clarify our intentions to force a complete stop of rocket fire from Gaza, but also allow Hamas more opportunity to exert control over the space and allow a quiet summer for residents of the area."